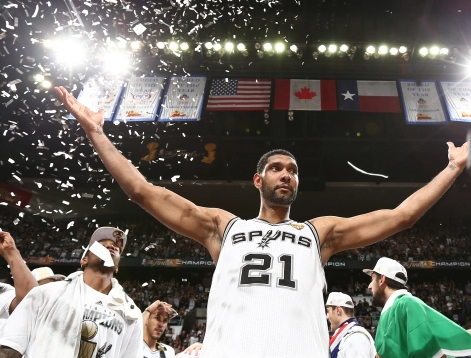 Tim Duncan has announced his retirement from the NBA after a 19-year career with the San Antonio Spurs. The 40-year-old spent his entire professional career with the franchise, which selected him with the No 1 pick of the 1997 draft. Duncan came out of Wake Forest University and went on to reach the play-offs in each of his 19 seasons. Since being drafted few players have won as many honours as Duncan, who claimed five NBA titles and was named to the All-Star team on 15 occasions, only four off the record held by Kareem Abdul-Jabbar. He won his first NBA title in 1999, just his second season in the league, and went on to add further championship rings in 2003, 2005, 2007 and 2014. His 1,072-438 regular season record (.710) is the best over a 19-year stretch in NBA history and best in any of the four major US sports over the last 19 years. Duncan is the only player in NBA history to win 1,000 games with the same franchise and only the third to reach that career landmark. “Tim Duncan is one of the most dominant players in NBA history,” NBA commissioner Adam Silver said. “His devotion to excellence and mastery of the game led to five NBA championships, two regular-season MVP awards and a place among the all-time greats, while his understated selflessness made him the ultimate team-mate.